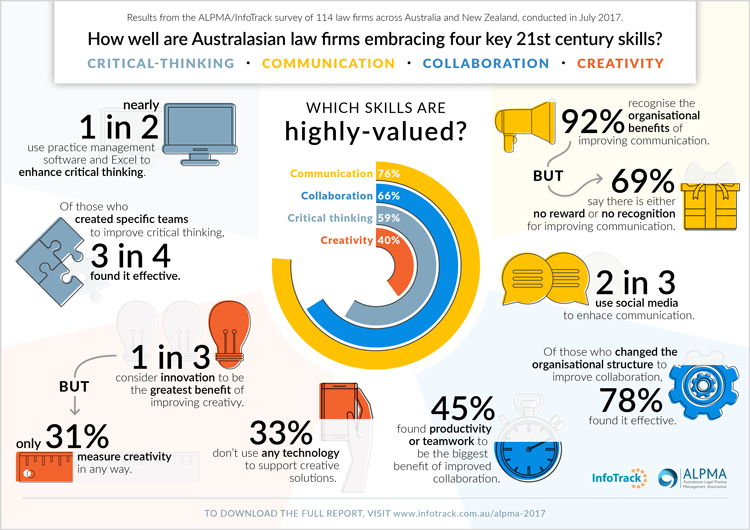 The ALPMA/InfoTrack 21st century thinking at Australasian law firms research measures how well Australasian law firms were embracing the key 21st century learning skills of creativity, critical-thinking, communication and collaboration, as defined by the influential P21 organisation. The research is part of ALPMA’s on-going research program that aims to help law firms successfully adapt to the changing legal landscape. More than 100 firms participated in this year’s research – and the results make compelling reading.